Posted 6:33 pm by Administrator & filed under News. 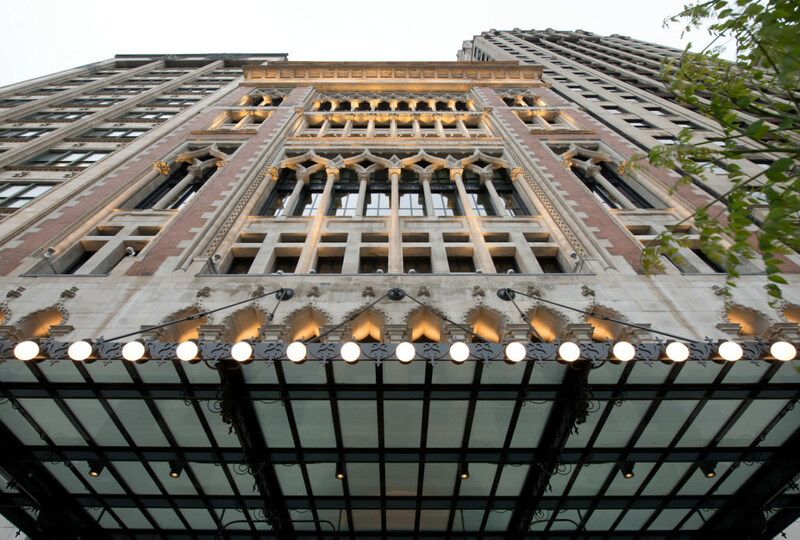 The Chicago Athletic Association hotel celebrated its grand opening on May 27, 2015. The Henry Ives Cobb-designed building, which served as a private athletic social club upon its opening in 1893, is now open to the public for the first time in its history. The ribbon cutting ceremony was commemorated with speeches by City of Chicago Mayor Rahm Emanuel, John Pritzker (Chairman, Commune Hotels & Resorts), Niki Leondakis (CEO, Commune Hotels & Resorts), and Ben Weprin (CEO, AJ Capital). Distinguished guests Ald. Brendan Reilly (42nd Ward) and Scott Silverman (Co-Founder, Agman Partners) were also in attendance. AJ Capital Partners, who oversaw the development, retained HPA in the summer of 2012 as project architect. Driving the redevelopment was the desire to preserve the building’s legacy while making it the epicenter of the City’s social scene – all while retaining as many of the structure’s original details as possible. The project, which showcased the firm’s strengths in restoration, new construction and interiors, was not without its challenges. “The building had been continuously modified during the club’s 114 years of existence and so we had to resolve the numerous structural complications and disparate architectural styles that existed at the project’s outset,” added Paul Alessandro, HPA’s Preservation expert. HPA was able to work closely with general contractor Bulley and Andrews to renovate the building while respecting this history. Today, the building has been spared and restored to its former glory. It sits in the historic Michigan Avenue Landmark District, is a Chicago Landmark and has been placed on the National Register of Historic Places. The renovated Chicago Athletic Association’s 241 boutique hotel rooms and exceptional amenities such as the stunning White City Ballroom overlooking Millennium Park; the Madison Ballroom; and the two-story Stagg Court gymnasium that serves as a recreational facility and event space. Restaurants include Cindy’s, located on the new, open air rooftop; Shake Shack, on the ground floor; and several second floor venues operated by Land and Sea Dept., including the iconic and revitalized Cherry Circle Room that served the club for generations as a restaurant and bar; The Milk Room, a prohibition-era whiskey bar; and The Game Room, a cocktail lounge complete with game tables, bocce, foosball, checkers, chess, shuffleboard, billiards and cards. For additional project information, please visit the CAA Project page.